Charming apartment in house, completely independent with private garden and pool. Located on the fringes of the village of Casciano di Murlo, about 20 km from Siena, in the heart of the beautiful Tuscan countryside. Lovely view of the hills, shaded veranda with garden furniture and private barbecue. Peaceful. The apartment (about 55 sqm) is located on the ground floor and opens directly onto the veranda and garden. It offers a spacious living room with TV and double sofa bed, a kitchen and dining room (with washing machine, toaster and dishwasher), a triple room with a double bed and a single sofa bed, a bathroom bathroom with shower. Elegantly decorated. Terrace with garden furniture and barbecue. WiFi Internet. Private pool (6m x 12m) with sun loungers and parasols, located in the large garden with a beautiful view of the surrounding hills. Casa acogedora con todo lo necesario para una buena estancia, menaje muy bueno y con todo lo necesario. Piscina espectacular y los dueños te facilitan todo lo que necesitas. Shops and restaurants nearby in the same village of Casciano di Murlo. 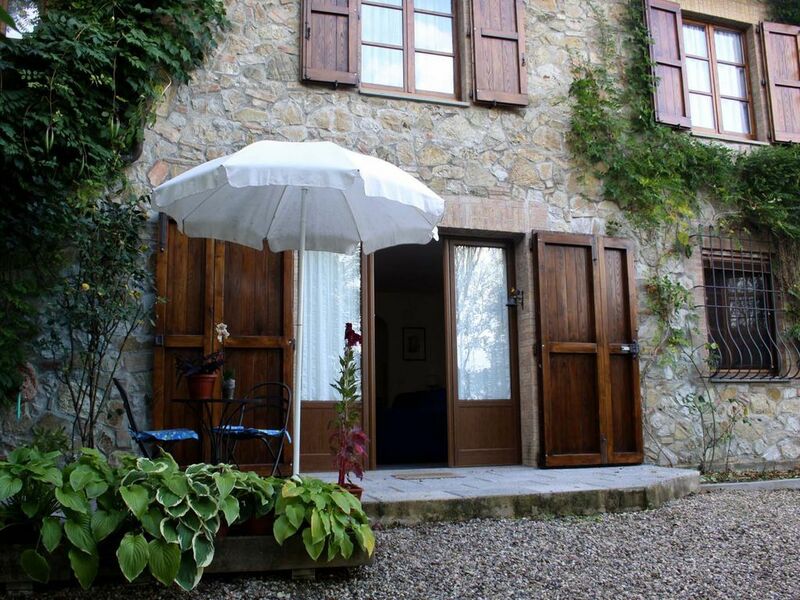 Central location, ideal for exploring the art cities of Tuscany and its beautiful landscapes, such as the nearby nature reserve of the Lower Merse, or the thermal baths of Petriolo. En haute saison (juillet et aout) la location est à la semaine et va du samedi au samedi uniquement.